A grass with very tall, hollow stems. Long, flat leaves spread out widely from the stem, growing 4 to 20 inches long and 1 to 1½ inches wide, with rough edges and a fine tip. The leaf collar, or ligule, a small outgrowth where the stem and leaf join, is a ring with dense, stiff hairs. Tawny, purplish flowers have long, silky hairs and occur in a large, plumelike panicle 6 to 20 inches long. Blooms in midsummer; seed set by late September. 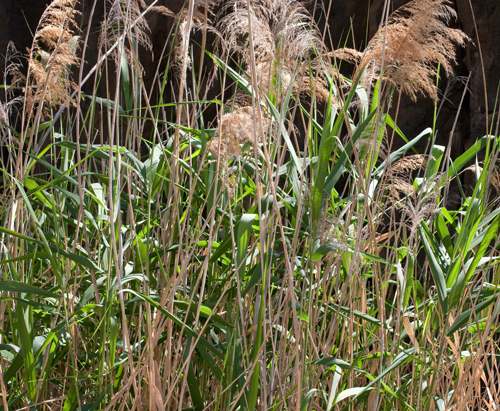 Common reed occurs in disturbed or pristine wetlands, including shores of ponds and lakes, marshes, springs, riverbanks, roadsides, and ditches. It grows best in areas with slow or stagnant water and is able to tolerate frequent, prolonged flooding, seasonal drying, and moderate salinities. It prefers full sun and it is generally shade intolerant.